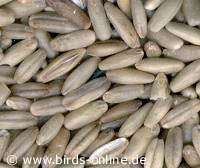 Nearly each common seed mixture for budgies and other pet birds contains some peeled oat (see photo on the right). 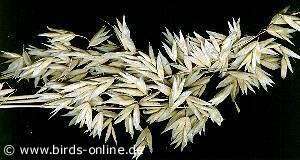 The scientific name of this plant is Avena sativa. Some sellers offer oat ears. This is a very good food for many pet birds because it takes them quite a while to reach the seeds. For a bird, "working" for its food is a natural way of spending the day. Since many pet birds are sometimes a bit bored because there is the same routine each and every day can become more satisfied when they have to work for their food. The figure below shows some oat ears. Attention: If you want to prepare sprouted grains from a seed mixture that contains peeld oat you have to pay a lot of attention to those grains. Peeled oat rottens quickly and becomes moldy.